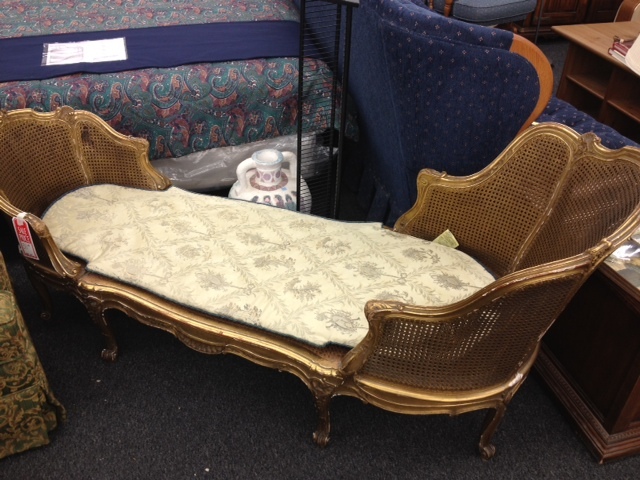 Rachel's Nest: Goodwill find-cane settee! I am so excited about this find! I went to Goodwill last Thursday looking for shelves and maybe a dresser or table that I could refinish for various little corners of the house. I didn't find what I was looking for, but I did find this beauty! I instantly fell in love with it! I'm pretty sure it called my name and said, "take me home!". The price tag on it said $30. WHAT? I couldn't believe it. I was fully expecting it to be over $100. I text Josh this picture with the words "I want", and when he quickly text back, "ok", I was so confused! I expected him to ask what this ugly thing was, and to beg me not to bring it home! I took advantage of his cooperation and snatched this up before someone else did! It's not in perfection condition, though. There are a few cracks in the frame and a small area of the cane is broken (you can see it on the left side), but overall it's sturdy, and I'm pretty sure I can repair the few flaws it has. I'm going to do a little more research on it before I start messing with it. I'm pretty sure it's not a real antique, but I just want to double check! What do you guys think of this piece - ugly or awesome?! Do I have any antique experts reading who can weigh in on it's age or value?! Stay tuned for updates on where I'll be putting this, and what I'll do to give it a little makeover! I think it's awesome and would have totally scooped it up for only $30! Are you thinking of repainting it or leaving as-is? I think its a neat find but yeah, needs a little bit of a makeover. :) Looking forward to seeing the "after" photo! Hey Nicole! As long as it's not an antique, I'll be repainting it! Definitely making a new cushion for it too! I love this find! It's gorgeous, I would have been ecstatic too. Can't wait to see what you end up doing with it! I can't wait to see your plan for it! Great find, Rachel!